One part of our installation will be a re-creation of Jenks’s office at the museum. There are many interesting questions about the nature of this recreation. Is it a period room? A stage set? Is it designed to capture an important moment in Jenks’s life? Does it capture not only a physical setting, but also an emotional one? Does it help us understand something of Jenks’s personality as well as his work? The first step in any re-creation like this is research. 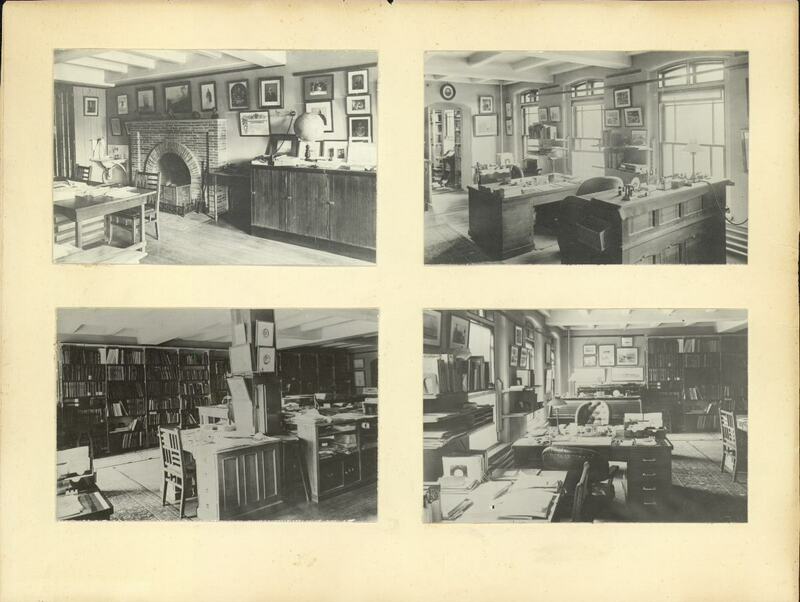 What pictures can we find of late-nineteenth century curator’s offices? For questions like this, the history-of-natural-history listserv is ideal. A quick call there (thanks very much to everyone who responded to my inquiry!) and some poking around on websites, brought some fine images. 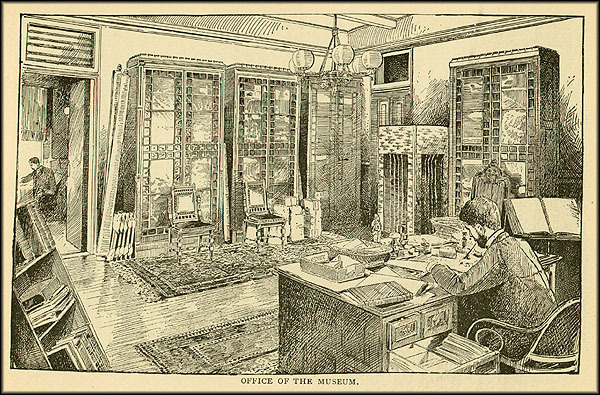 Secretary Baird’s Office at the Smithsonian, 1878. Courtesy Smithsonian Institution Archives. 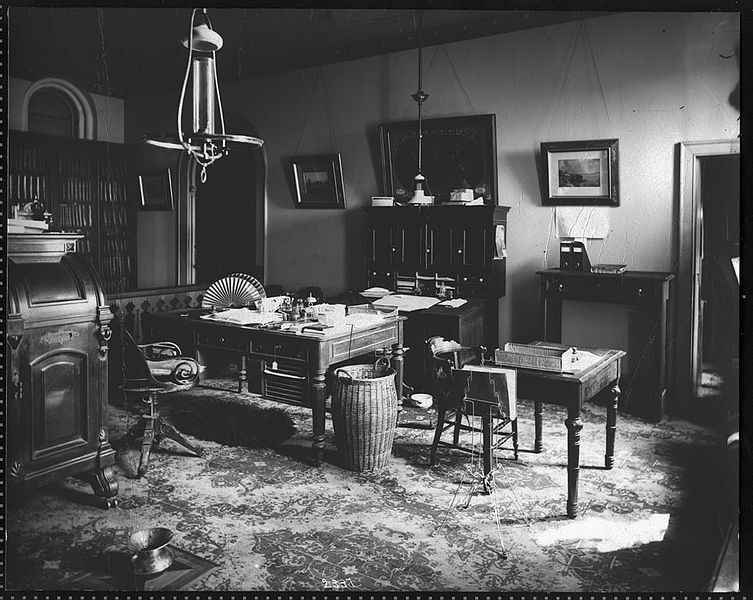 Alexander Agassiz’s office at the Museum of Comparative Zoology, Harvard, about 1902. Courtesy Mayr Library, MCZ. These are grand offices. Cluttered with acquisitions to be processed or examined, but grand, with fine furniture. 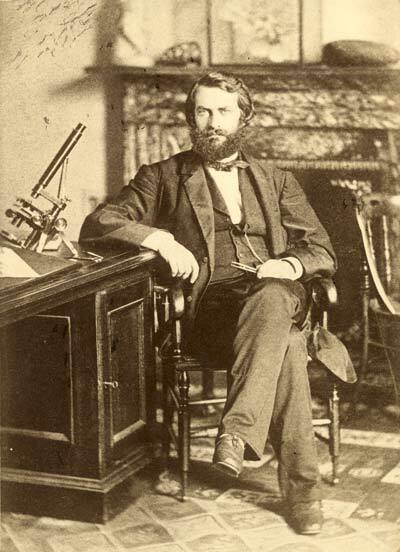 American paleontologist Edward Drinker Cope in his office at the Academy of Natural Sciences, Philadelphia, in the 1870s or 80s. 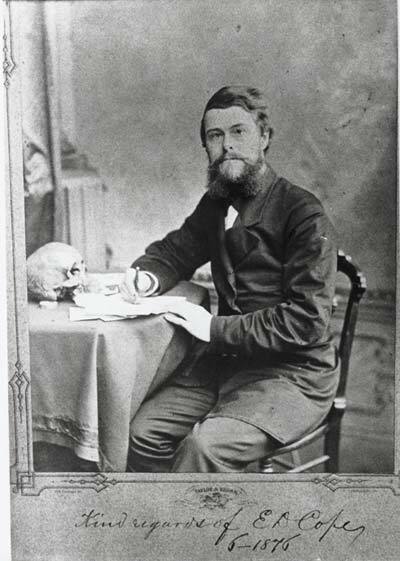 Paleontologist Joseph Leidy Cope in his office at the Academy of Natural Sciences, 1870s or 80s. 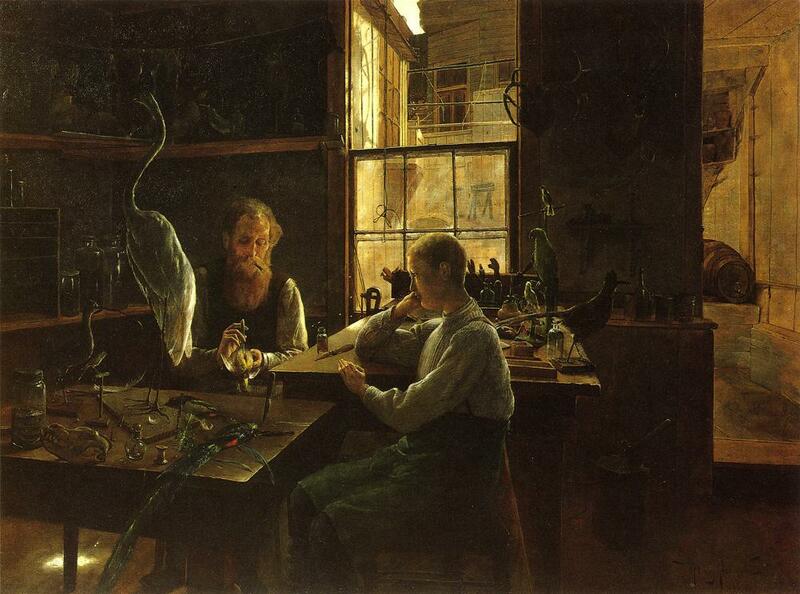 But Jenks was at more a taxidermist than a scientist, really. Perhaps this image, of Dutch taxidermist and bird photographer Paul Louis Steenhuizen (1870-1940) was closer? 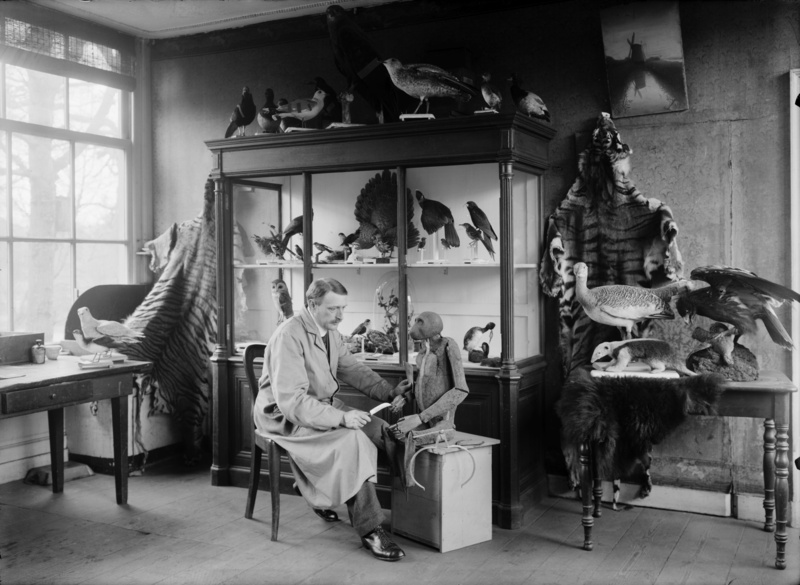 Dutch taxidermist and bird photographer Paul Louis Steenhuizen (1870-1940), mounting a Bonobo in his workshop in the Zoo of the Royal Zoological Society Natura Artis Magistra in Amsterdam, 1918. Or, this, paleontologists at work at the Field Museum? 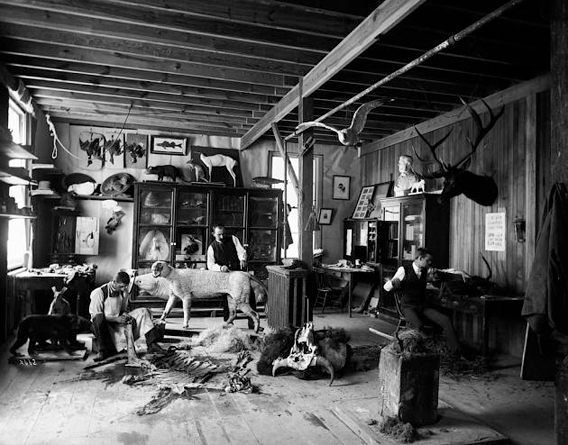 Or this image of William Temple Hornaday, chief taxidermist at the Smithsonian, in his workshop? 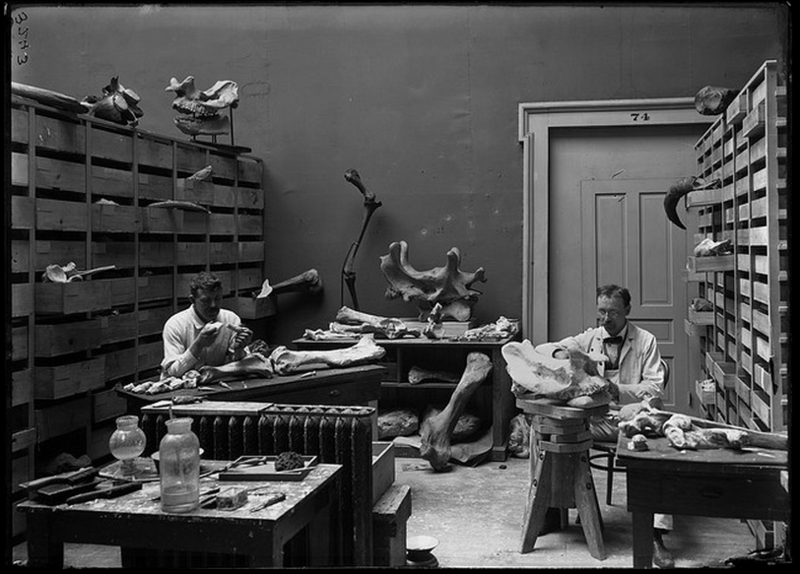 William Temple Hornaday (center), Taxidermist and Zoo Keeper, Andrew Forney, and another unidentified man, working in the taxidermists’ laboratory located in a shed in the South Yard behind the Smithsonian Institution Building. Courtesy Smithsonian Institution Archives. Still much to figure out. But the Sharp description, and the Alexander painting, give us a pretty good idea of the feel of Jenks’s office – or rather, his, office/workshop/home away from home. It also tells us something about the man, about his personality. How to capture that in the reconstruction of a physical space is a project for next semester. #lostmuseums symposium attendees - New #publicart by #MayaLin "Under the Laurentide" is right around the corner from Metcalf.